G-Power unveils their first iteration of the super-tuned up BMW M. Dubbed Bi-Tronik III, the sporty sedan takes its limits to a new level. 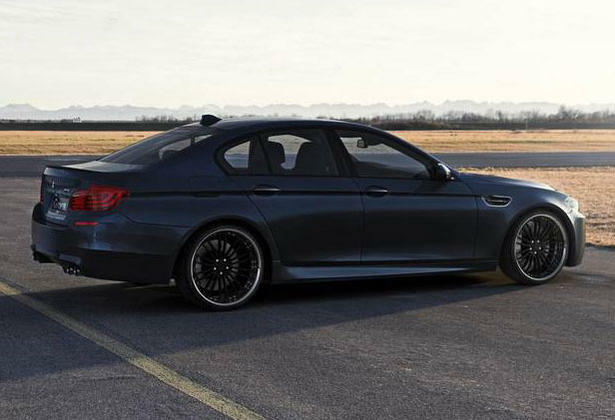 From the factory standard 560 hp/ 680 Nm, the German tuner pushes the M5 to now produce 640 horsepower and 777 Nm of torque (572 lb of torque). 0 to 62 mph now comes in just 3.9 seconds and top speed was raised to 315 km/h (195 mph). To cope with the increased power, a G-POWER Braking System is included in the most likely very expensive package (pricing to be released at 2012 Geneva Motor Show). The braking system uses six brake pistons and up to 396 mm brake disc diameter. The G-POWER brake package is completed by brake pads with a larger pad area, higher friction rate as well as metal-coated brake lines.